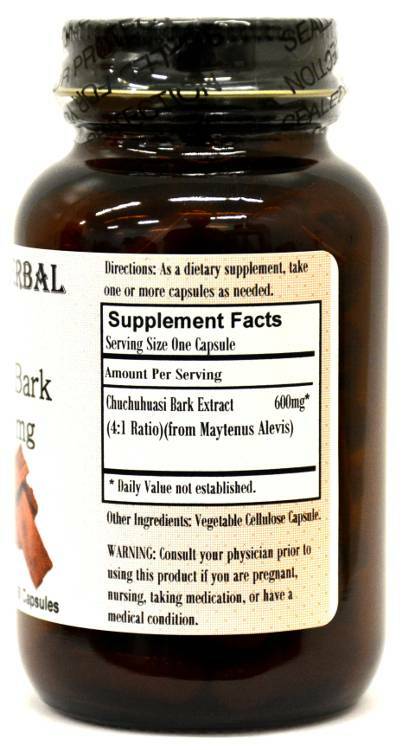 Barlowe's Herbal Elixirs now offers a 4:1 Chuchuhuasi Powdered Extract. Chuchuhuasi is well known in Amazonia as a general tonic, a mild stimulant, and as a libido booster for both men and women. Traditionally, Chuchuhuasi is also used to treat joint and back pain. Bottled in Glass! No Stearates! No Fillers! No Junk! 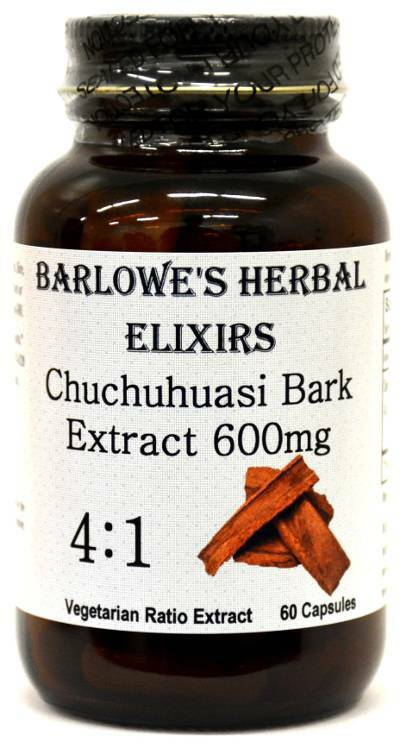 Barlowe's Herbal Elixirs now offers a 4:1 Chuchuhuasi Powdered Extract. Chuchuhuasi is well known in Amazonia as a general tonic, a mild stimulant, and as a libido enhancer for both men and women. Traditionally, Chuchuhuasi is also used to treat joint and back pain. 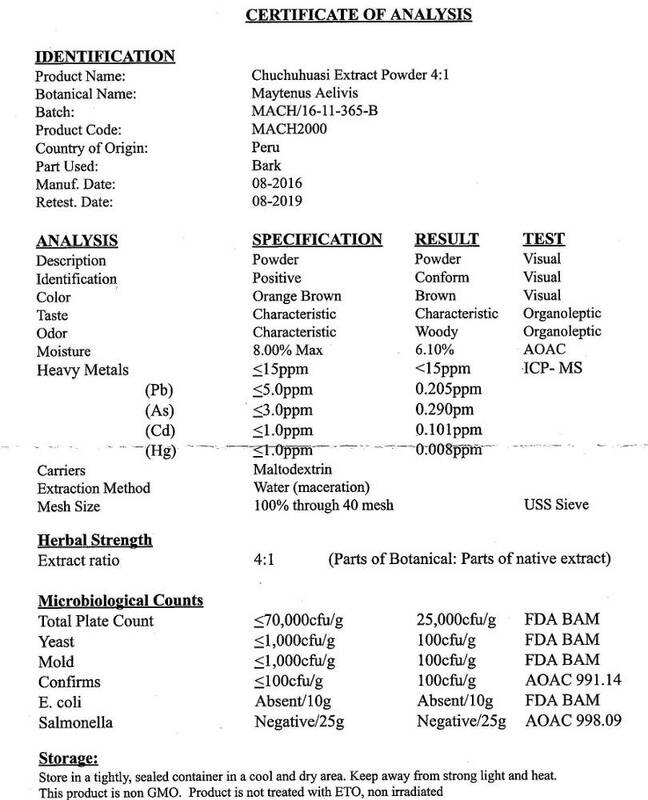 The Chuchuhuasi Certificate of Analysis (COA) of this particular batch is shown above. Bottled in Glass! No Stearates! No Fillers! No Junk! Traditionally chuchuhuasi is used to relieve pain and inflammation (Chuchuhuasi means "trembling back", indicating its long standing use for back pain), to restore vigor, and for relieving menstrual pain and enhancing libido. It may also balance adrenal function. Chuchuhuasi is pretty close to an all-in-one remedy. Chuchuhuasi contains a variety of naturally-occurring compounds, including the alkaloids mayteine and maytansine. The bark is rich in several alkaloids, tannins, triterpenes and sesquiterpenes. The protein kinase C (PKC)-inhibiting agents in chuchuhuasi have been studied by Sphinx Phatmaceuticals of Durham, NC. PKC is implicated in many chronic degenerative disorders. ATTENTION: IF YOU HAVE ANY PRODUCT QUESTIONS, PLEASE CONTACT BARLOWE AT 954-479-4320. WE DO NOT ACCEPT PHONE ORDERS. SORRY. Gonzalez, J. G., "Chuchuhuasha—a drug used in folk medicine in the Amazonian and Andean areas. A chemical study of Maytenus laevis." J. Ethnopharm.1982; 5:73–7. Caution: This extract is generally safe, but it is potent and should be utilized with care. This product is for dietary use. If unexpected side-effects occur, discontinue use immediately! For more information, contact Barlowe at BarlowesHerbalElixirs.com. The above statements have not been evaluated by the Food and Drug Administration (FDA). This product is not intended to diagnose, treat, cure, or prevent any disease. Directions For Use:Take one or two capsules twice daily with water, or as needed, on empty stomach. For some people, dosage may need to be increased as results and usage amounts vary based on body type and weight.